Last week, in part 1 of my Glencoe Adventure blog, I shared with you the images and stories from my time at the Dawn 2 Dusk Glencoe photography workshop. This week, in part 2, I will be showing you what I got up to with the 24hrs I had between arriving in Glencoe and the start of the workshop. I had booked the workshop more than 12 months in advance so I had plenty of time to organise and plan my trip. Though the workshop started at 1 pm, the risk of being delayed if I decided to travel up on the day was just too great. So the only option was to travel up the day before. Rather than opt for a mid-morning departure from Devon and arrive early evening in Glencoe, I decided that a very early start was in order. If I left at 5 am and undertook the 520-mile journey, I could feasibly make Glencoe for about 3:30 pm, just in time to get some sunset pictures! I then also had the morning to do a dawn shoot, with perhaps some post-breakfast shooting and all before the start of the workshop. My plan had been hatched! Rather than write about the 24 or so hours I had in Glencoe, I've documented my adventure in my latest vlog. Check out the video below, and if you haven't subscribed to my YouTube channel then what are you waiting for! Needless to say, I did not regret that 4:30 am alarm call! 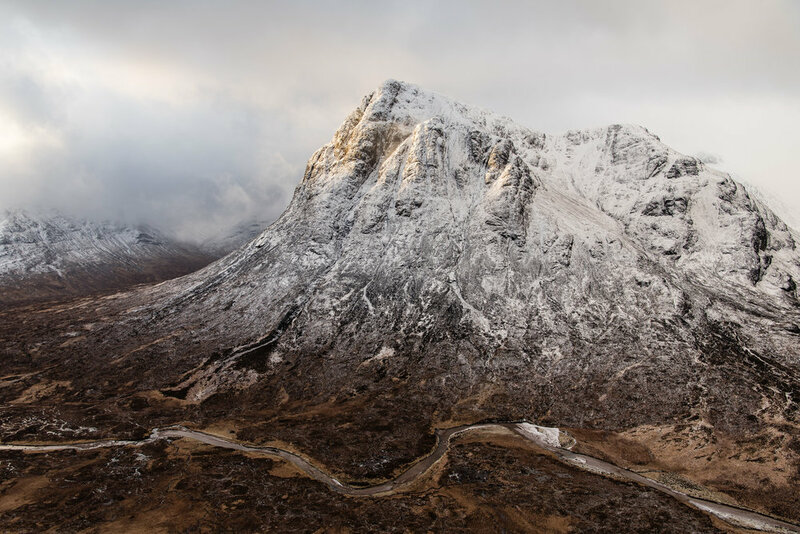 The gallery below is a collection of the images that I took during my 24hr adventure in Glencoe. They are in the video but sometimes it's nice to see them in a bit more detail so click on an image to bring them up in a lightbox. The video is just a snapshot of my 24 hours before the workshop so here is a few stories that weren't in the video. Firstly, while the journey from home to Glencoe took around 10 hours, it didn't feel like a very long drive. The principle reason for this is entertainment. I've been a long time subscriber to Audible and listening to a good audiobook is a great way to pass the time on those long car journeys. For the journey, I started a new book called Fear the Sky by Stephen Moss and read by R. C. Bray (who also read the other excellent sci-fi book The Martian). I had a feeling it was going to be good (as it was recommended by the same person that recommend The Martian to me), but I was engrossed from the moment the story started. Let's just say that I almost didn't want the journey to end! Most landscape photographers drive a lot and if reading any of the Game of Thrones novels seems like an impossible task then why not pass the time with a good audio book. One of the shots that I wanted to get while I was there was a sunset shot of Stob Dearg (Buachaille Etive Mor) from the River Etive. To get the shot that I wanted I would need to wear a pair of waders (as inspired by this Thomas Heaton video). I borrowed my father-in-law's waders and put them in the boot of the car, unsure whether I would actually need them or not. When I arrived in the layby near my planned shooting location I felt a bit silly putting on waders to go out and take images. No one was about though so I set off on the short walk to the location where I would shoot. However, as I approached the spot I could see another photographer there. This is generally not an issue and I'm always up for a bit of a chat but what would this person think if they saw me wearing waders to take photographs! Well, imagine my surprise when he also was wearing waders! All of a sudden it didn't feel that odd to be wearing a pair of waders to take photos. The chap in question was Johnny Baird and we joked about what the odds would be that there would be two photographers named Baird, wearing waders, taking landscape photographs from the middle of the river that evening! Landscape photography can be a solitary pastime so it's nice sometimes when you meet a like-minded individual and you can chew the fat over photography while standing in the middle of a river! Johnny has a wonderful portfolio of landscape images and I strongly suggest you check out his Facebook page. After my epic early morning of photography shooting Stob Dearg from Beinn a'Chrulaiste I was hugely satisfied with my morning's work. After breakfast though I thought I go and see if there was anything else I could shoot before the workshop started in the afternoon. I also thought it would be a good chance to properly test out my latest addition to my kit bag, the DJI Mavic Pro. One of the locations I visited was the spot where you can photograph Stob Dearg and the River Coupall. As this is such a hugely popular spot for landscape photographers I was not surprised to see another couple of photographers there already. I didn't want to spoil these photographers experience of the location so I did ask if they didn't mind if I flew the drone around the area. It wasn't a problem and as the drone is often a talking point we also got chatting about drones and photography in general. The conditions at the location were also ideal for stills photography. The snowy peak of Stob Dearg was clearly visible, there was some cloud in the sky and plenty of water in the river. All I had to do was walk the very short distance back to the car and get my DSLR. Except I didn't. I already knew that we would be visiting this very location in a couple of days during the workshop so why would I bother shooting it now. After all, I'll get the same shot when I return. Having grown up in Scotland I really should have known better. After all, Scotland is well known for having weather that produces all four seasons in one day. Sure enough, when I did return with the workshop group the conditions were totally different. One of the main focal points of that spot is the visibility of Stob Dearg but when I returned it was covered in cloud. Though I waited and waited for the cloud to clear it never completely cleared, leaving me regretting my rather silly decision of not shooting the scene when I was there earlier! Lesson learnt. Even if I'd only had those 24 hrs in Glencoe it would have been a worthwhile trip. As I said in the intro of the video it's important to go on an adventure every now again and push the boundaries of your landscape photography. It took time and effort to get up Beinn a'Chrulaiste at dawn to get those shots of Stob Dearg but it was worth every step to have the pleasure and simplicity of shooting up there. The previous few weeks shooting in my local area hadn't been hugely successful and this trip to Glencoe gave my passion for landscape photography a well-needed boost. So if you are struggling with what to do next with your landscape photography take a few days off work, grab your camera and go somewhere where you've never been before. It will be time and money well spent! So when was the last time you went on an adventure with your photography? What's the furthest you've driven to get a photograph? Let me know in the comments below.